One Goal. 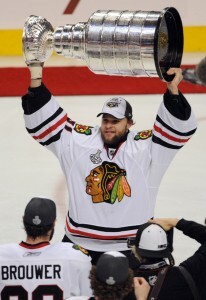 Entering into the 2009-10 season, that phrase became the mantra and rallying cry for the Chicago Blackhawks. After laying the foundation, and going through the dark years, the ‘Hawks had finally positioned themselves to take the next step in their Decade of Dominance. After losing to the Detroit Red Wings in the Western Conference Final the year before, the Blackhawks had a very up and down offseason. On July 1st Chicago signed the big fish in the free agent pool when the inked forward Marian Hossa to a 12 year $62.8 million contract. Hossa hitched his Stanley Cup dreams to the Chicago Blackhawks after being on the losing end of the last two Stanley Cup Finals. In 2007-08 Hossa was a member of the Pittsburgh Penguins team that lost to the Detroit Red Wings, and the following season in a cruel twist of fate he was on the Red Wings team that lost to the Penguins. The signing of Hossa signaled the end of Martin Havlat’s ‘Hawk career. The team announced on July 2nd that they would not bring back the reigning team MVP and leading scorer. The Blackhawks also waved goodbye to goaltender Nikolai Khabibulin, the team’s netminder for the previous four seasons. Taking his place between the pipes was Cristobal Huet, a key acquisition the year before. Just when everything looked bright for a Chicago, a huge blunder threatened to bring it all down. General Manager Dale Tallon failed to get the team’s qualifying offers for that year’s restricted free agents in on time. Tallon managed to get those players under contract, including forward Kris Versteeg, but in turn cost the team millions of dollars. That blunder led to Tallon being demoted to Senior Advisor, and in his place stepped Stan Bowman. The Blackhawks opened the 2009-10 season in Helsinki, Finland for a two game set with the Florida Panthers. The Panthers defeated a Huet led Chicago team 4-3 in the opener. Chicago got a strong performance out of newly announced backup goaltender Antti Niemi in the second game. The young finish netminder stopped all 23 shots he saw in the game, giving Blackhawk fans a glimpse of things to come. After losing their North American opener, Chicago rattled off four straight wins, including a remarkable comeback against the Calgary Flames. Calgary jumped out to a 5-0 lead only to see the ‘Hawks roar back and win it 6-5 on a Brent Sopel overtime game-winner. Four games later Chicago got a scare when Jonathan Toews was drilled by Willie Mitchell of the Vancouver Canucks, forcing him to miss a few games with a concussion. Chicago got a boost in November while riding a seven game winning streak. Making his season debut after missing the first month recovering from offseason shoulder surgery, Hossa quickly made his presence felt scoring a goal on his very first shot against the San Jose Sharks. In the month of December Niemi started making his bid for the starting netminder job, stopping 32 shots in an overtime win against Pittsburgh, along with a 33 save shutout against the Red Wings in Detroit. The 09-10 season was special in another way for the Blackhawks, as Jonathan Toews, Duncan Keith, Brent Seabrook, Patrick Kane, Hossa, and Tomas Kopecky represented their respective countries in the Winter Olympics. With the NHL season at a standstill Toews, Keith, and Seabrook’s Team Canada would defeat Kane’s Team USA to bring home Olympic Gold. The month of March was not be very kind to Chicago, as the team finished with a 6-7-2 record, the only month the team failed to finish above .500. It was a painful month, as the ‘Hawks lost defensemen Brian Campbell to a broken clavicle on a questionable hit from Alexander Ovechkin. Ovechkin was suspended two games for the hit. Campbell would not be the only defensemen to go down. In the team’s very next contest Seabrook took a shot to the head from James Wisnewski, forcing him to miss two games with a concussion. The team responded in April, finishing with a 5-0-1 record, only dropping the season finale to Detroit in overtime. That loss pushed Chicago into a second place finish in the Western Conference, but Chicago had won their first division title since 1992, setting a team record for wins with 52 and points 112. More importantly Chicago was headed back to the Stanley Cup Playoffs. The Blackhawks began their march towards the Stanley Cup Final against the Nashville Predators. Although expectations were high for the team, Nashville stunned the ‘Hawks in Game 1 with four third period goals to take a 1-0 series lead. Chicago rebounded in Game 2 on the strength of Niemi’s 23 save shutout, something that had not been done since 1996. If the ‘Hawks thought they had Nashville figured out, they were sorely mistaken. In Game 3 the Predators beat up Chicago, outhitting them 32-18 in a 4-1 win. Facing a 2-1 series deficit, Chicago got a boost with the return of Campbell from his broken clavicle in a Game 4 victory to even the series up at two. The tide turned for good in Game 5 when Chicago pulled off an improbable comeback on the strength of Patrick Kane’s short-handed goal with 13.6 seconds left in the third period. With Hossa sitting in the penalty box serving a five minute major for boarding, Kane turned a Martin Erat turnover deep in his own zone into the game tying goal. In the overtime period, the man serving a penalty became the hero. Hossa jumped out of the box and skated to the front of the net. Taking a Brent Sopel pass, Hossa buried the puck behind Pekka Rinne to send the United Center into a frenzy. Chicago closed out Nashville with a 5-2 victory in Game 6, sending them back to the second round. The ‘Hawks faced a familiar foe, the Vancouver Canucks, in the second round. For the second straight series Chicago would be stunned in the first game, this time losing 5-1 on home ice. A third period rally in Game 2 saved Chicago from going down 2-0 in the series, with Versteeg scoring the game-winner. In a 5-2 Game 3 win, Chicago, spurred by Dustin Byfuglien, Dave Bolland, and Adam Burish, began to chip away at the psyche of the Canucks. In Game 4 Vancouver came completely unraveled, taking 8 penalties in a 7-4 loss. After dropping Game 5 by the score 4-1, Chicago closed out the series with a 5-1 win in Game 6. It marked the first time since 89-90 that the team made it to back to back Conference Finals. Chicago took on the Presidents Trophy winning San Jose Sharks in the Western Conference Finals. Backed by a 44 save performance from Niemi, Chicago won their first series opener with a 2-1 victory. Chicago set a record with their seventh straight road playoff win in a 4-2 Game 2 victory thanks to a two goal performance by Troy Brouwer. In Game 4, Niemi once again come up large, stopping 44 of the 46 shots he faced in a 3-2 overtime win. The man known as “Big Buff” would be the overtime hero, when he beat Evgeni Nabokov 12 minutes into the extra period. Chicago completed the sweep with a 4-2 victory in a Game 4 that became more known for a gruesome injury to Keith. In the second period of the game, Patrick Marleau attempt to send the puck down the ice ended up hitting Keith squarely in the mouth. Keith went to the dressing room, but return several minutes, seven teeth lighter. After an 18 year wait, the Chicago Blackhawks were headed back to the Stanley Cup Final. The Stanely Cup Final between Chicago and the Philadelphia Flyers started with a wild opening game, with a combined 11 goals scored. Chicago would be on the winning end of the game, thanks to unlikely hero in Kopecky. After being a healthy scratch since Game 5 of the Vancouver series, Kopecky found himself inserted back into the lineup due to an injury to Andew Laad. Kopecky would reward Coach Joel Quenneville’s trust in him by scoring the game-winner on a pass from Versteeg in the third period. The game saw Flyer goalie Michael Leighton (five goals on 20 shots) pulled in favor of Brian Boucher, and two goals by the man who replace Kopecky in the lineup, Brouwer. The next game saw the return of the type of series everyone expected this to be, with Chicago prevailing in a tough 2-1 game. The ‘Hawks got goals from Hossa and Ben Eager, while also getting a 32 save performance from Niemi. With the series tied 2-2, Chicago headed back home with a little doubt in their head. Sensing the team needed a change, Quenneville split up his top line, moving Kane to the second line, and Byfuglien to the third. If it was a wakeup call he was going for, he got it. In Game 4 the ‘Hawks came out roaring with three goals in the first period alone. The teams traded goals in the second, with each team scoring two apiece including goals by Kane and Byfuglien. The third period would play out in a similar fashion, as Philadelphia could never close the gap. Byfuglien put the dagger in Philadelphia with an empty-net goal late in the third period. If the young Blackhawks felt any nerves going into Game 6, they didn’t show it. Byfuglien got Chicago on the board late in the first period, but Scott Hartnell tied it up with 27 seconds remaining in the period. In the second period Daniel Brier gave the Flyers the lead 12 minutes in, but the ‘Hawks responded two minutes later with one of their own thanks to Patrick Sharp. Chicago took the lead with three minutes left in the period, when Laad beat Leighton. With three minutes left in the game, and Chicago on the brink of their first Stanley Cup Championship in 49 years, Philadelphia got a lucky bounce off of Ville Leino’s stick and Hossa’s stick right to Hartnell, who put it behind Niemi. The teams would not have to wait long for the game to be decided. Four minutes into the overtime period, the wait for Chicago was finally over. For the Chicago Blackhawks, it was One Goal achieved. Subscribe to our Blackhawks stories to get email updates every time a new story is published.